Compared to last week, feeder cattle prices were down $3 to as much as $6 across all weight categories. Most auction barns were closed last week for summer holidays and only small volumes traded in the key regions of Alberta. Feedyards are also running a skeleton crew, providing some much-needed time off after a busy spring. Extreme heat across the Prairies also made buyers and sellers think twice about shipping cattle. While it’s a very slow period in Western Canada, larger supplies south of the border appeared to have feeder market on the defensive. U.S. auction market receipts were over 600,000 head, which is almost a record. Feeder cattle futures were under pressure late in the week, but U.S. cash markets traded $3-$6 above week-ago levels. Alberta feedlots are experiencing better-than-expected margins. Alberta packers were buying fed cattle in the range of $151-$155 and current pen closeouts are hovering around breakeven. A relatively weak Canadian dollar, stronger fed cattle prices and softer feed grain values continue to point to stronger prices longer-term. Therefore, feedlots are securing ownership sooner, rather than later. In central Alberta, a small group of medium-frame fleshier mixed steers averaging just over 900 lbs. sold for $181; black mixed heifers averaging 950 lbs. traded for $170 in the same region. The steer-heifer spread narrowed this past week. Mixed steers averaging 790 lbs. were quoted at $200 landed in southern Alberta. Mixed medium-frame heifers weighing 750 lbs. were quoted at $188 in the same area. There are a few pockets in Western Canada that have experienced drier conditions but we haven’t seen any ranchers forced to sell so far. 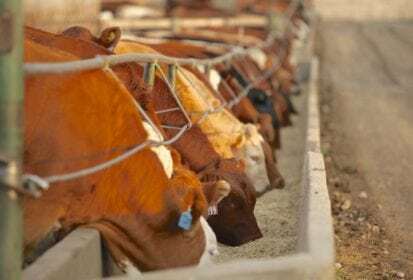 Feedlots continue to pick away at small groups of calves coming on the market, with local buyers setting the price structure. Mixed Simmental steers weighing around 540 lbs. were quoted at $226 in central Alberta while mixed heifers averaging 555 lbs. were quoted at $210. Beef demand is coming in larger than anticipated, as the U.S. and Canadian economies run on all cylinders. Historically high consumer confidence, low unemployment and rising wages along with lower taxes have resulted in a year-over-year increase in disposable income. Americans have more take-home pay and this has supported the overall beef complex.